Momofuku, means 'lucky peach'—or at least according to David Chang, owner of the massively popular (and totally legendary) Momofuku chain of restaurants. Is he lucky? Maybe. But he's also he's damn good at what he does, and what he does is create some of the best Asian-American fusion food in New York City. Although the Momofuku group has several restaurants Momofuku Noodle Bar is our favorite for its affordable price point, friendly service, and friggin' amazing food. Whether you get ramen, chicken, boa, or one of their creative sides, Noodle Bar basically kills it on every dish. We had a brussel sprout dish that practically had us licking the bottom of the bowl—that's right brussel sprouts the least appetizing of the vegetables, and it was to die for. The restaurant itself has a super laid back attitude we imagine Chang is all about. The long communal tables are meant to seat several, so you're usually paired with strangers. Once the food comes there's no time for awkwardness, because as you know perfect ramen is only good for the first few minutes so you gotta eat it quick while it's prime. The ramen at Momofuku Noodle Bar is good, and perfect for ramen virgins who want to try the dish but perhaps are a bit intimidated by some other more authentic ramen shops in the city. If you're not an old pro at ramen just remember to get the soft-poached egg on top, it's the frosting on the ramen cake. Don't miss the fried chicken, Momofuku is known for it. If you have a big group order the 'large format' fried chicken which feeds 4-8, but you can usually also order it as a side dish if you're dining alone. 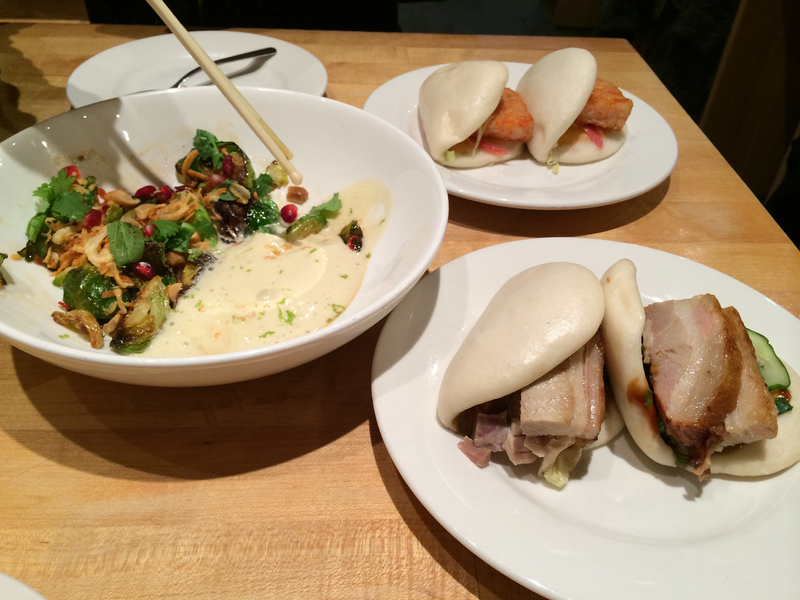 Prices at Momofuku Noodle Bar aren't dirt cheap, but it won't break the bank either… unless of course like us you order one of everything on the menu. Our nice server did warn us that it was a bit overboard, but you only live once right?